Jelli has launched a demand-side platform for buying broadcast radio ads. Called SpotPlan, the technology makes buying inventory programmatically in the iHeartMedia network, and the Katz Expressway network, quicker, easier, and more precise. SpotPlan launches with buy-in from major ad agencies Starcom, Mediavest|Spark, Dentsu Aegis Network, Horizon Media, Havas Media, IPG Mediabrands, and Varick Media Managements. That cluster of buying power represents about $1-billion of radio ad spending every year. SpotPlan brings automation and much greater efficiency that buyers of digital media categories are accustomed to. RAIN News spoke to Mike Dougherty, CEO of Jelli, about the significance of SpotPlan’s demand-side software added to the programmatic infrastructure already in place. Dougherty compared it to buying Wall Street stock through a broker on the phone (pre-SpotPlan) to using E-Trade where it happens on-screen in an instant. The efficiency gain is even more dramatic than that. 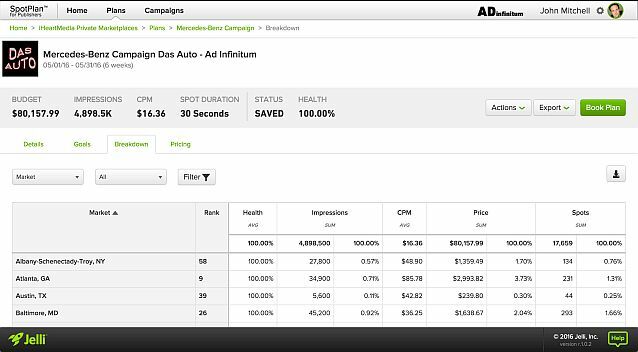 Before SpotPlan, agency buyers could identify the inventory they wanted based on audience attributes and campaign needs. Buying the campaign across many radio stations could take days, as agency would have to call radio station sales departments to complete the order. So, it was half-programmatic. SpotPlan puts a self-serve portal in front of agency buyers, enabling them to accomplish the buy, even across dozens of stations, in a couple of minutes. Advertisers can infuse their campaigns with audience target data that goes beyond zip-age-gender (ZAG) to identify consumer behavior, purchase intention, and other characteristics important to marketers. Some of this data is first-party is harvested from iHeartRadio, a top-to-bottom digital platform where listener behavior can be intelligently mapped to broadcast station listenership. 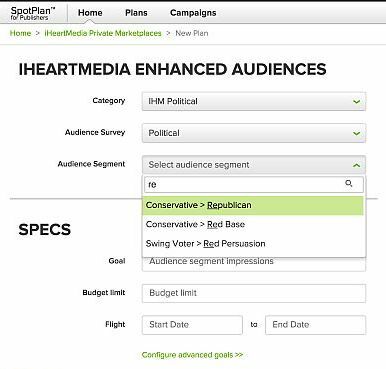 So, while every impression of an ad on a listener may not be defined and targeted as is the case (ideally) in web display programmatic, iHeart has developed a data management platform (DMP) which hooks into SpotPlan and get ads into the ears of receptive listeners. “This new tool puts the power of programmatic radio directly into the hands of marketers, achieving ROI that is unmatched in other media,” said Bob Pittman, CEO of iHeartMedia. SpotPlan is currently available to the agencies listed above, in what Jelli is calling an Early Access Plan. “This collaboration enables these strategic agency partners to be on the cutting edge, driving innovation to move the radio market forward,” said Mike Dougherty. Hear Mike Dougherty speak at RAIN Summit West, in The Data & Measurement Marketplace — a powerful discussion among leaders in the field. RAIN Summit West is April 17 in Las Vegas, alongside the NAB Show. Schedule and speakers HERE.